After reading your post, my mouth watered 🙂 I wish a can some how get the Pinkberry yogurt , especially with the strawberry toppings. I am not living in USA, not now I wish I was. Food available there is of high quality compared to what I get in my country. If you liked PinkBerry, you should try Yogurt Land! Fourteen over in Crittenden has Red Mango and/or Fraiche at lunch! In MTV the gelato place on Castro is very popular and has rave reviews. Across the street from Red Mango in Palo Alto is a place that also serves sour yogurt and might be worth checking out. Matt, if you haven’t been down to Gelayo Gusto, just West of Castro on El Camino, I highly recommend it. My girlfriend considers herself a frozen yogurt connoisseur; and claims that Gelayo Gusto is superior to Pinkberry. I love this post. I’m not sure if it’s because food is inherently a great topic or because there was mystery involved in the origins of Palo Alto’s Red Mango or because of the intrigue in making a business from game show prize money. I say we revamp the Webmaster Central Blog and focus solely on yogurt. How does this product compare to frozen yogurt? Could they freeze it and ship it still create the same great experience? Uh, almost all yoghurt has a slightly sour taste… at least in my country (Ireland) and where I live (UK), but probably across most of Europe. There is something to be said for regulation of chains, as it slows down the scary homogenisation you see in some areas, where every shop and restaurant is some chain outlet. If you’re ever in Minnesota, the Leeann Chin restaurant chain has their own sour yogurt product called Red Cherry. It’s very good. “Yogurberry is opening a store on Castro Street in Mountain View soon” Huh, wah? The Googleplex doesn’t already have a Pinkberry or some such thing already inside of it? Have you tried Froyo? There’s one in the Vallco shopping center in Sunnyvale. Try http://www.yogurt-land.com/ in the same plaza as Elephant Bar in Cupertino – this pinkberry thing is pretty addictive! It’s amazing how many copycats there are. In fact, I heard that Pinkberry is also a copycat. Happy Yogurt tasting! You should also try Gelayo Gusto near the corner of Castro and El Camino (http://www.yelp.com/biz/gelayo-gusto-mountain-view). 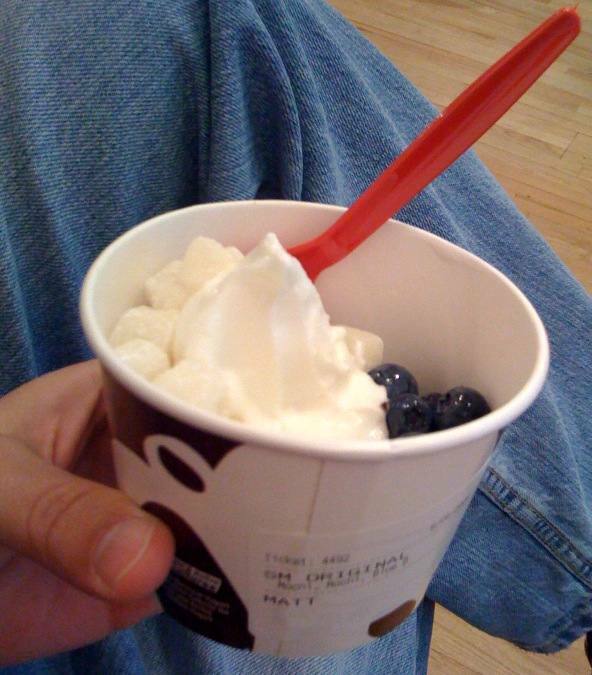 It’s got the very tasty sour frozen yogurt, and is really well run – a ver inviting atmosphere. Not sure about the mochi though – I’ll have to look next time I’m there. Pinkberry Rocks my world! So glad you were able to try it. We have several in the los Angeles area and it is a BIG hit here. What do you think of Kefir. It is excellent in nutrition. Not as tasty as Pinkberry, but probably more nutritious. Check it out sometime bro. you can make fantastic pinkberry-type yogurt at home. its super easy. just buy a cuisinart frozen yogurt maker and use _good_ plain yogurt. using trader joe’s organic plain yogurt will give you a flavor almost indistinguishable from pinkberry. i have also used stonyfield farms plain yogurt with similarly great results. I love pink berry, it’s one of my common NYC spots. In SF there is a pretty good spot, not pink berry. But they do have a few sour variations called Icebee, right across the back of the Bloomingdales mall on Mission. See http://www.yelp.com/biz/icebee-san-francisco for details. This sounds quite similar to Mediterranean/Greek-style yogurt. You can usually find it in places like Whole Foods. In particular, there is a brand from Quebec, “Liberté Mediterranean”, which sounds like it might be very close to what you’re describing. Insanely delicious stuff. Robert Synnott, agreed. But it seems weird to give approval at one point and then pull that approval after work is underway. panzermike, for some reason I’m not a big fan of Kefir, or of Greek Yogurt. Maybe my taste buds will continue to mature over time? Icebee? I’ll have to check that out sometime when I’m in the city–thanks, Aaron Shear. OMG, get thee to Yummi Yogurt. I know there is one in San Mateo, but I think there is one way down El Camino Real too, maybe in Palo Alto. Pray that they have the Pumpkin one in the lineup for the day. It is so very very good. I wouldn’t say Matt has been insufferable listening to him go on about this yogurt, but the enthusiasm is certainly there and infectious 🙂 I caved to it and tried Red Mango and did find it to be really good. I’ve snacked on plain yogurt at work, which is certainly tart. My take on Red Mango is that it’s plain yogurt but sweetened in a subtle way that doesn’t supplant the tartness, but emphasizes it somehow. 100% amatuer take, YMMV. It seems that plain yogurt seems unpalatable to a lot of people, and having been around vanilla all my life it’s only in the last few years I’ve found plain to be my preference. If you transfer to the Kirkland Google office, there are 2 yogurt places within a short walk. Pinkberry! My wife and I ate this 1 or 7 times last year in NYC! I liked the green type with crunchy things in it. I like Soy Yogurts from the grocery store – I seem to be on a permanent diet so eat no dairy like a good boy…. I have YET to find a decent Mexican “joint” here in Charlotte NC after three years – I was spoilt for choice in San Francisco with all the Mom and Pop shops. I bet that stuff is low in fat and cholesterol correct Matt? Harith and Aaron Pratt, Red Mango yogurt is nonfat (and kosher and gluten-free, although those don’t matter as much to me). Try Tartini in Cupertino. It isn’t quite as creamy as Red Mango, but their quality and flavors are the best I’ve had in the bay area (and I’ve had a lot). My wife and I spent our honeymoon in Amsterdam last year. To save money we decided to buy some bread and cheese and milk from supermarkets to eat in our hotel room. All of the packaging was in Dutch so we inadvertently bought the wrong kind of “melk” – “carne melk” is what we bought, I think. It turned out to be about the viscosity of a milkshake and tasted like unsweetened yogurt, a bit like an unsweetened Yop (dunno if those are available outside of Canada). Holy moly, was it incredibly delicious. It was exactly the kind of thing you want in your tummy first thing in the morning. I would wholeheartedly recommend it to you if I could only remember what it was called! I bet Joost would know. Wasn’t this stuff featured in the Cavemen sitcom that spun off of the Geico commercials? Your vivid descriptions of the delicious yogurt is making me want to go get one. Come to a visit in Bulgaria and i’ll let you taste a home made yogurt. Non of the factory made beats the taste of the real one. I’ve seen the AMEX Pinkberry ads which are cool. But there is absolutely nothing better than Ollie’s Frozen Custard in Dekalb, IL. For some reason frozen custard is a midwest thing, I’d never heard of it before being introduced by my wife. They are only open 6 months a year and I’ve been up there and seen the line 100 deep on Friday nights. Haha congrats on finding Pinkberry — but I must tell you Yogurtland is much better than Pinkberry! And its cheaper too – only $0.30 an ounce … not too mention its ALL self service with tons of flavors of yogurt to mix and try. And personally I think the texture of the yogurt is much better too! Pinkberry and the rest are over-rated — Yogurtland is best. OOH, my FAV-o-RITE is Red Mango. I’m super excited that they’re opening one up this Saturday 9/20 in Cupertino by Amici’s. If I can’t make it to the S.Bay, my 2nd favorites (a tie) would be Jubili and YoCup in Sf. PinkBerry opening stores everywhere here in LA. They actually opened up two locations in my living room last month. i had pinkberry for the first time in nyc about 2 months ago. i had fruity pebbles and bananas for my toppings. it was heaven. No wonder Google is penalizing innocent websites. The head of anti-spam is on an epic quest for curdled milk. Meanwhile, we have thousands of users devoting their entire waking lives to contributing original content, which is never found by searchers using Google because said search engine’s algorithms all date from the pre-Pinkberry era. in germany yogurt looks much more fluid. The best testimonial I can give for Pinkberry on the upper east side 80’s and 1, 2, or 3rd…is that even in dec./jan. there were people lined up down the block for it. Craziness. That and it’s the only place where an $9 yogurt could possibly be worth it. As for SF – There’s a place near the Metreon (can’t remember the name) – not quite as good, but they let you have all the toppings you want, and you weigh your yogurt at the end. Very yummy making a yogurt sundae frankenstein mashup. Oh – and moochi does rule…didn’t know they had that at pinkberry. If you head up north a ways, you might want to check out Yumi Yogurt in San Mateo. Matt that’s some yogurt, it’s made a post on your blog, it has to be something unique. Well, after reading the post I’ll definitely try to find it and get a taste of it and of course I will surely remember to take it in a medium size cup so that not a single topping falls to the ground and gets wasted. I really like your blog and your posts……cool stuff. I’m an artist who’s really interested in language, and particularly in the way that technology and advertising affect language. The link between Google and yoghurt might not seem obvious to all, but after watching an advert for Dannon’s Activia with “bifidus digestivum” (the UK name for what in the US is called “bifidus regularis”) I Googled the term and all I could find was blogs asking “what on earth is it”? It sounded like pseudo-science to me (I mean, really – “digestivum”? ), so I investigated further and found out that Activia is effectively just live yoghurt, like you’ve been able to get in health food stores for decades. The idea isn’t primarily that people get good information, although that’s part of it too. It’s that because of the structure of language on the Internet, and the way that search engines work, you can start to undo the use of pseudo-science in advertising that seeks to disguise the fact that, in this example, Activia is just expensive live yoghurt. I think about this in terms of pseudo-science being a kind of language camouflage that conceals the truth of the core message of the advert – i.e. this yoghurt is digestive science in a pot – and it’s really interesting to me that Google and search engines in general can unmask that core message. Anyway, if you’ve got time I’d be interested to hear what you think given your more extensive experience with search engines. After reading all this interesting discussion I am yearning to go and grab a yogurt now…..
Can’t eat that stuff – mildly lactose intolerant AND frozen teeth gives me a bad headache for hours!! I have tried pinkberry before and also red mango. My strength is not in being able to taste the flavours of the yogurt and the fruits in combination and express the taste using intricate words, however I do know that they both taste great! I have always loved eating ice cream and fruits. Never had I put much thought into eating both ice cream and fruits together. I did fall ill with a condition called IBS and since then have not been able to eat ice cream but yogurt however, seems to gel fine with my digestive system. I really do not know why this is. Many of my peers who have IBS also love yogurt and have been able to eat them to their blue in the face without having to run to the washroom. Know if only I can build a recipe for this so that IBS sufferers alike can go through my IBS-friendly diet recipes and have a dessert menu in which they can create to eat as many of us are unable to through the front door in hopes of not having to run to the washroom before they get to either a pinkberry or a red mango. Turkey, and I’m proud of the motherland. Yogurt beneficial to humans in terms of nutritional value and is very useful. Colitis, allergies, osteoporosis, indigestion, hypertension leads to bad cholesterol, and cardiovascular disease, a powerful protector, especially the “A”, “B”, “E”, vitamins, mineral salts, calcium, phosphorus, magnesium content diet for people with very good food ..
← How to delete “nobody” files from a directory I own in FreeBSD?